And I have so so much to be thankful for. Mostly my family. These children. Friends. Our home. My husband’s job. Our health. It is Grant’s third Thanksgiving, and Greta’s very first. I keep asking Grant, “What are you thankful for?” I love asking him questions that are outside of his usual realm of knowledge. He doesn’t “get” what it means to be thankful. But he did just randomly kiss my arm, so I’d like to think that, if he did understand it, I would be high up on his list. I went to Target last night, and I checked out right before they closed. There was a guy wrangling carts in the parking lot, and he had already collected from the area where I was parked. Rather than put my cart back in the corral (and making him come back to get it), I pushed it back to the store and handed it off to him. He gave me a huge smile and thanked me for it. It made me feel good, and I’m not writing this to toot my own horn. I try to be nice when possible. I’m not perfect and sometimes I’m in a hurry or act selfish, but I am trying to live my life more intentionally. I am realizing so much about life lately. I don’t know if it’s because I am getting older or because I have children now or what. But I want to live a beautiful life. To see and be the good in the world. To teach my children that it is better to be giving than to be taking. They are too young to understand that, but I want to lead by example, and actually live that way. In December, I am going to try to do something every day that makes another person happy, or makes someone’s day better, or easier. Even if it’s my own children or my husband… but not something I would do every day anyway. Yes, it’s nice to pour my husband a cup of coffee when I pour my own, but we do those things for each other every day. However, I might not bring it up to him with a love note while he’s working upstairs. But I bet that would make him feel more loved and appreciated. I want to do little things, even if those things go mostly unnoticed. Letting someone into traffic. Letting someone cut in front of me in line. Paying for the person behind me at the drive-thru Starbucks. I hope you’ll join me. I will write more on that later. But, for today, I am going to enjoy my family and good food and be thankful for the things that I have. Because there are many, many things that I am blessed with today, and every day. It has been a long couple of days. My husband is out of town, and I am looking forward to his return late tomorrow. I’d love to say it’s just because I miss him, but it’s mostly because I miss his help, haha. It is tough being on your own with a newborn and a toddler… I mean, I am on my own with them a lot, but haven’t had to do nighttime completely by myself. I always get at least a little help in the evenings, and usually it’s a lot of help. I am tired. Last night was tiring. It was a busy day today (but a good one! ), but tonight was pretty difficult when it came to bedtime. However, I am typing this in bed, and taking a few moments to myself before I get some sleep. And it is so peaceful. And I am listening to my babies sleep, one on each side of me. And those long peaceful breaths. And my beagle softly snoring. I don’t know what this night will bring. How my unpredictable, inconsistent children will sleep. But I am right in-between them, and it is wonderful. 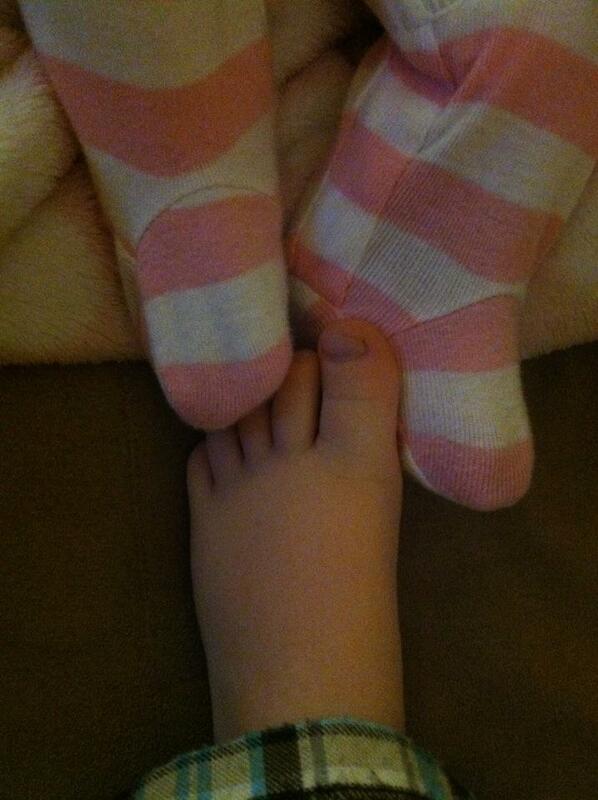 As a mother, it is such a safe feeling having them both within arm’s reach. My husband: Grant, do you know what your middle name is? My husband: What is it? Grant’s new favorite word? “Shubbup.” I’ll give you one guess as to what that means, and one more as to how I feel about it. Greta followed up that beautiful, wonderful night of 7.5 straight hours of sleep with two really crappy nights. I shouldn’t be too hard on her; she’s still sleeping okay for a newborn, and these “bad” nights are nothing compared to a few weeks ago. But still. I am le tired. I need a housekeeper ASAP. Are there volunteers for that? No? Damn. I just spilled a (half-full? half-empty?) mug of coffee. Because I had forgotten that it was there. Because it takes me 2 hours to drink it. Because 2 kids + 2 hands = a need to be able to do a whole lot with each hand. Ironically, the more I need coffee, the more difficult it is to consume. edit: I thought today was Wednesday (hence the title). It’s Thursday. At least we’re over the hump? Wowza. Cheap, easy DIY basketball hoop makeover. Most random blog title ever? Anyhow. It might sound weird but hear me out. We have one of those toddler basketball hoops in our back yard. Grant enjoys it. Inside the house, we have an assortment of different balls for him to choose from, and he loves to play catch and throw them. I would like a specific PLACE for him to throw those balls, rather than at the windows. 😉 So I decided our play area needed a small basketball hoop. 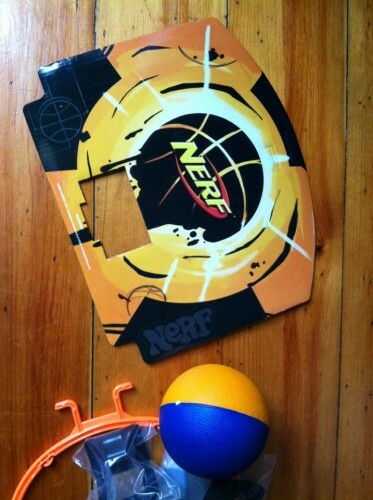 As it turns out, basketball hoops tend to be either nice looking and expensive, or ugly and inexpensive. I wanted a hoop that was nice enough looking (we don’t have a separate playroom, just a section of our living room devoted to toys/play), but I wasn’t about to pay $30 for one. I was at Target the other day looking at the options (again) when it hit me. Duh, get a little crafty and make the cheapy nets look nicer. I bought this basketball hoop for less than $6. And it came with a ball. Score! 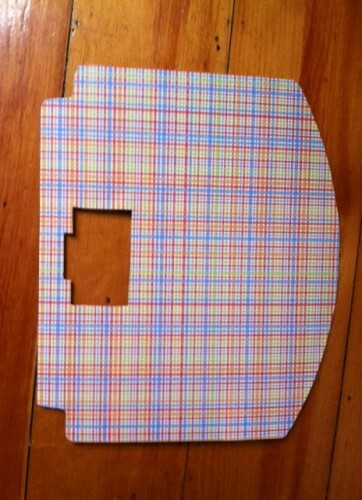 It is the PERFECT size for scrapbook paper. Which I already had, so I actually didn’t spend any money making this except for buying the hoop itself. Yay! All I did was trace the backboard onto the scrapbook paper, cut it out, and apply with a paper adhesive (I use the 3M stuff found in the scrapbooking section at Target, but regular glue or spray adhesive or whatever should work just fine). Next, I assembled according to the instructions. I also added a few embellishments that came with the book of scrapbook paper. Finally, I used those Command strips made for hanging picture frames (the velcro kind) so I could mount it on the wall instead of hanging it over a door. I like the look of this so much better than the original, especially since it’s right in our living room. 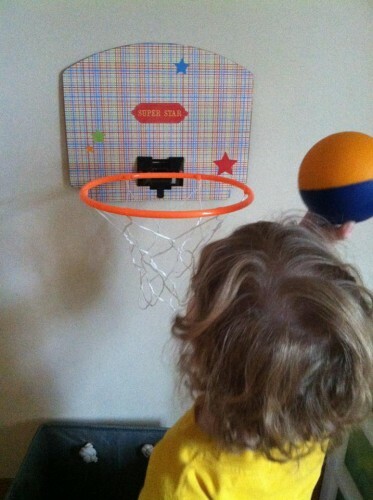 It would be really easy to update the look of the backboard, too… so when it inevitably gets wrecked by my super destructive little dude (or I just get sick of the plaid, or we finally get around to painting the living room) then it will be a very quick and inexpensive fix. My son absolutely loves this thing. I’m so glad I did this, it was one of the best $6 I’ve spent because he has played with it every day (and I don’t have to whine about how expensive one of the nicer, plainer ones was). Wow, have the last two months been a whirlwind. A beautiful, emotional, amazing whirlwind. Adjusting to having two children has been quite a task. But it is honestly going so much better than I could have expected. I have done my best to truly enjoy it all. Despite the lack of sleep and the roller coaster of toddler emotions, it has been a great couple of months. I try to live in the moment. Notice the little things… the way a newborn smiles, the smell of her skin, the excitement in my son’s voice, the look on his face when he figures something out. The weight of a child in my arms, how different the two of them are but also how beautifully similar. Grant amazes me. He is the sweetest little boy. He is so NICE to his sister. He is so patient when she needs my attention. His jealous moments are few and far between, and (so far) have still been met with patience. He genuinely seems to love his sister. It’s so cool to see this from a two year old. He’s always been a sweet, cuddly little boy. But he’s also rambunctious and sassy. 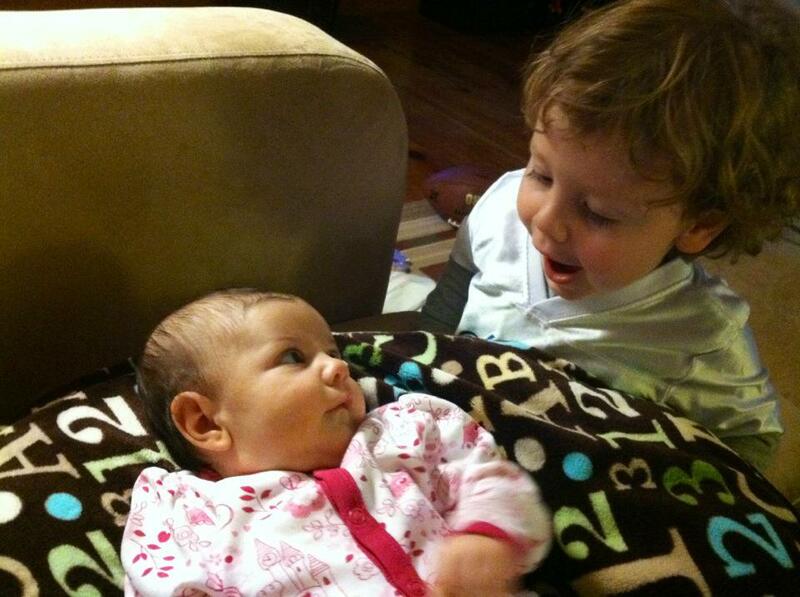 With his sister, however, he tones it down. He wants to hold her. He wants to hug her. He kisses her a hundred times a day. He says cute things like “Hi Greta!” and “Sister smiling!” and yesterday he held his hand up and said, “High five, sister!” (but it’s even cuter coming from his toddler voice… “greh-wa” and “sistah” are more like it). Greta is finally starting to sleep better. Last night we hit an amazing milestone: she slept for 7 1/2 hours straight. I slept for 7 of those hours, although I did wake up at 5am in a panic and had to check to make sure she was still breathing. She was. She is a little sweetheart. She has been fussier than Grant was, but still relatively easy. I have been lucky to have two kids who aren’t colicky and who calm down easily. I can take them anywhere as long as I wear them. Seriously, my Ergo is worth its weight in gold, as cliched as that sounds. Greta wakes up smiling. She is in that sweet cooing stage right now. Grant gets a kick out of that. She adores him and he adores her. I knew I wanted kids close in age, and I was excited to see Grant as an older brother… but I am blown away at watching this sibling relationship develop. Greta is only 2 months old, but she already has such a little personality coming out. I love when she smiles at me and then gets kind of bashful and excited, and turns her head away with a huge gummy grin. I spent a few days last week sorting through outgrown kids clothes. Not much depresses me as much as that. I passed down a lot of my son’s baby/toddler clothes to my friend, who is expecting a boy this winter. I am way too nostalgic, I get really sentimental about him growing up and it makes me cry and I have a hard time with it sometimes. As much as I love watching him grow, it can be really difficult to let go. And now I’m facing these same issues and emotions with my daughter (who is already wearing some 6 month clothes, and is taking after her brother in rapidly outgrowing things). A friend of mine posted on facebook the other night about wishing she could hold her kids as babies one last time. She asked those of us with young babies to give them an extra snuggle that night. I thought about that when Greta was up at 3am (and again at 5). It is so tiring, but it is so fleeting. Babies are so special. I’d give just about anything to have another day with Baby Grant. I wish holding them tight would keep them little. But, of course, that’s not our job. Our job is to help them grow. Learn. Become big kids that turn into big people. 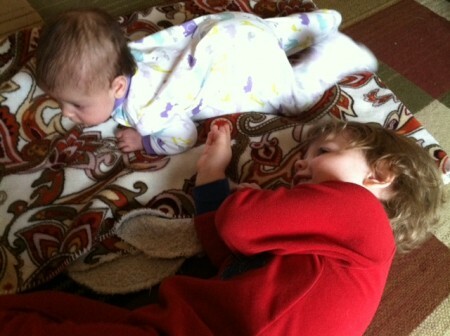 Somehow, Greta seems to be growing even faster than Grant did (and that was too fast). I’m sure it’s because we live with a toddler and everything is go-go-go. I wish it would slow down. Oh, these children. The days are long but the months and years and heartbreakingly short. I understand my own mother so much more these days. How kids can break their mama’s hearts without knowing it. It isn’t their fault. They can’t help that childhood is such a short season. I never knew I would love motherhood so much. I am lounging on the couch with my babies. Sorry, Grant, but you are not allowed to ever NOT be my baby. Greta joined our family on July 30th. I can’t believe she is already 8 days old. I will write more later, but even in this tired state I am so so so thankful for my life. I am curled up on the couch with both children as they take a nap. I can hear Grant snoring softly as I type, and when I peer over at Greta I see those sweet little newborn faces that they make… funny smiles, pouty squinty faces, fluttery eyelids, then complete serenity. I am also tired (very tired), but this time around I am so much more aware of how fast the time goes. I am trying to keep this in mind when I am struggling and getting impatient. They love me and want me and need me. I am the center of their universe, but I won’t always be. I can already feel Grant pulling away… he is still a mama’s boy, but he’s also making that transition from toddler to little boy. He’s so big now! And little Greta will be right on his heels. So, for today, the housework can wait while I enjoy this peace and quiet. While I enjoy watching my babies sleep, listening to their sleepy noises and feeling the warmth on each side of me. Feeling the weight of Grant’s legs propped up on me, the feeling of me a reassurance for him to continue to sleep. After all, it was only yesterday that Grant was this little. We don’t ever get these days back. Tonight, I said goodnight to my one year old for the last time. Also known as the Second Annual Bawl My Eyes Out Because My Baby Is A Year Old(er). I know I am too sentimental, but wow. It’s been another year? How? And will I cry every year on the night before our kids’ birthdays? At this time last year, he had only been crawling for a few weeks. It’s crazy how much he has changed in a year. He runs around like crazy, he climbs on everything, he has such a sense of humor, and he’s so smart. He’s my best friend. 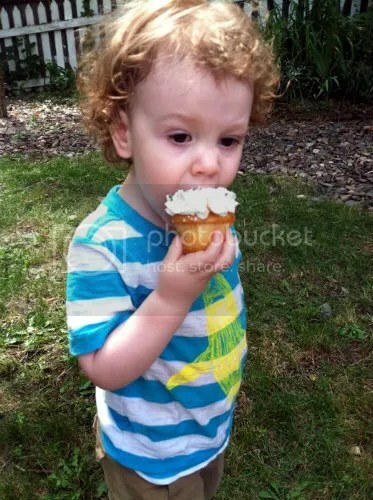 Tomorrow, my little boy turns two. Tomorrow, I will be 37 weeks… full term pregnancy. It all goes so fast. I am excited about this third year, with life with a two year old. I am nervous about what the next year will bring, as our family expands and we adjust to toddlerhood with a newborn. But, as I’ve learned, before we know it another year will go by, and I’ll be left reeling and wondering where all the time went. I will keep that in mind when things get tough. Happy Birthday, sweet boy. I love you so so so much. One of my goals for this year was to get rid of 2,012 things in 2012. On Sunday, while purging our basement with my husband, I surpassed that goal. Decluttering our house has been quite the undertaking. At first it was fun and even easy, as we got rid of really obvious things. Then you have to try a little harder, and you battle with the “What if I need this someday?” or “What if I miss this?” thoughts that sabotage your progress. But I found that, the more we got rid of, the easier it was to let things go. It became addicting. It was fun keeping track of the number of items, because it became a bit of a game. My husband, who can be a bit of a packrat (and who has more clothes than I do), even got in on it. I still have to challenge him, but I have noticed that he’s gotten a lot better about getting rid of things. He has noticed how much less clutter is in our house, how it is easier to find things that we do love or use. That it’s easier to keep a house clean when it has more empty space. That it motivates you to keep it that way, because messes actually stand out when they aren’t against a backdrop of STUFF. Our house isn’t perfect. We are both collectors and buyers, and decluttering will be a constant in our lives. Especially with kids in the house. People love to buy things for kids. And they outgrow stuff. Toys and clothes constantly need to be sorted and purged based on needs and wants, likes and dislikes. But the progress is there. Will we ever be true minimalists? No. But I have learned so much from this process. In just about six months, I have realized that clutter affects more than just the potential space in your home. It affects your moods. It’s a reflection of yourself. That having less really can be more. Purging toys, for example, has made it possible for my son to play better. No, really. Kids don’t need so many toys. Heck, he still has too many. But I noticed an almost immediate change in the way he played earlier this year, after getting rid of so many toys and keeping the categories more basic. He was able to easily find the things he wanted. He was able to remember where the toys belonged. He began to help put things away (usually with my prompting, but not always!). Yes, he’s still a toddler. He still likes to throw things and make messes, and that’s okay. He still knows that there is an order to things, and I think that brings a bit of peace to brain that already goes a million miles a minute some days. I would challenge anyone who ever feels like their house is always messy, or that they have too much stuff, or that they need to be more organized, or WHATEVER… to challenge yourself to do away with it. Go ahead and declutter. When I first saw the idea of “2,012 things in 2012” earlier this year, I thought, ‘Wow, no way could I get rid of that much stuff.’ I mean, looking around our house, it’s not like we belonged on an episode of Hoarders. You didn’t need to clear a path to walk to the kitchen. But it was surprisingly easy to find those things. It happened in layers. I’d declutter an area of the house, only to declutter that same area again later and find even more to get rid of (that I just wasn’t ready for the first time, or I didn’t even realize at the time that the stuff was unnecessary clutter). We got rid of some big things, and we got rid of a LOT of small and medium things. Clothes, accessories, shoes… nail polish and office supplies and old pictures… going through the layers of our home made me realize how much STUFF we had. And how all that stuff just got in the way. I am still decluttering. But it has become easier. It has become more of a maintenance routine, or a challenge to see what else we can do without. We still like things. We still buy things. But we have become pickier about what comes into our house, or what we buy. And, while purging our basement this weekend, we couldn’t help but laugh at ourselves as we tossed and tossed and then tossed some more. Because why did we keep all that stuff? Why did we move all those things from house to house with us? Never again. The next time we move, that stuff won’t have to come along. And some day, when our kids have to go through our stuff because we are gone, I hope that it is easier for them. That they will sort things that matter, either because they really did have meaning or because they really were useful items. And they won’t have to sort through box after box of crap that wasn’t worth unpacking from the apartment we were in six years ago. I will end this with some before and after photos. Because nothing can show a change quite like seeing it for yourself. 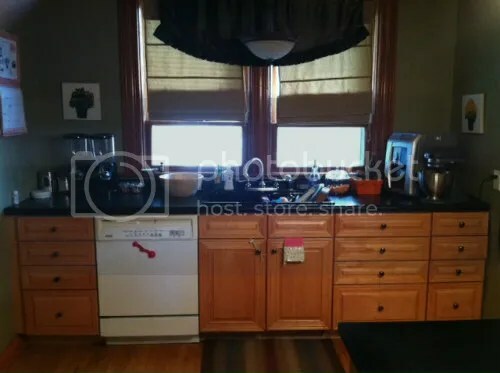 I have more that I will share another time… but here’s our kitchen. This is actually embarrassing to share, but I think it speaks volumes for how much my mentality has shifted. The first picture was taken in November, before I did a little facelift to the kitchen to brighten it up. It’s when I first became inspired to declutter. Just look at the first picture. 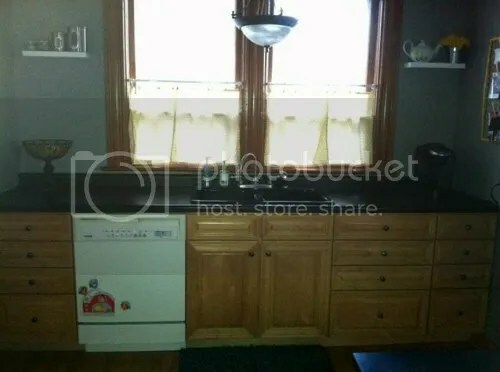 All that stuff on the countertops. Don’t mind the dirty dishes in the sink (if you can even find the sink). Minus that and some stuff on the way left-hand side, all of those things were on the counters at all times. I didn’t even see it as cluttered. 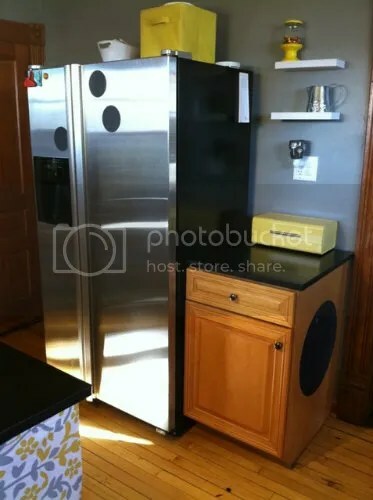 There are canisters, a cereal dispenser, more canisters, a fruit bowl, three soap dispensers, a candy dish, a cactus, a wine refrigerator, and a Kitchen-Aid mixer. Wowza. Not to brag, but the difference is astounding. 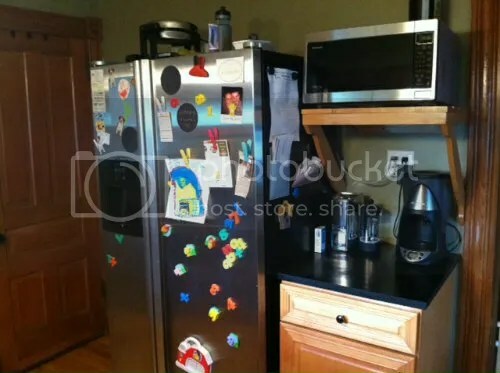 The after photos were taken a few months ago, and I can honestly say that if you walked into the kitchen right now it looks almost exactly like this. It actually makes me crabby now if there is a mess on the counters, because it stands out so much more now. I relish those clear countertops. 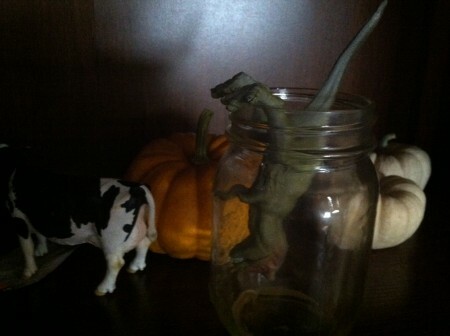 It motivates me to keep them that way. I end the day, most days, by cleaning up the kitchen so that it looks like that when I wake up. It is peaceful. It is nice to wake up and make coffee and start the day in a kitchen that looks this way, instead of that way. And I didn’t even realize how much the old way of living affected the way I lived and felt. I remember being a kid and going down to South Beach and spending hours and hours in the water with my cousins. But I had forgotten the absolute JOY that can be found in such a simple thing. Water. My son (my sweet, sweet son) has reminded me that water can be the very best thing in the entire world. Lately, it is his favorite “toy.” A couple of weeks ago I set up a playdate in our backyard, and put out all of these fun activities. But you know what got the most giggles, the most attention? Our garden hose. When I stood there and held it over the boys’ heads and let the two little toddlers soak themselves and shriek and laugh and get freezing cold and wet in a puddle of water. When we need a refresher in our day, I bring my son to our kitchen sink and let him play. He climbs right up now. I do my best to ignore the mess, the splashing of water on the windows, and admire how much pure joy he finds in splashing in the running water. It’s so simple, yet it invokes so many senses. Hot, cold, wet, splash, stomp. He learns. He sees how he affects things, how he can make the water do things, how he can control the nozzles and handles and water pressure and where the water goes. How the colored ice cubes almost hurt to hold onto, how they change the color of the water in the bin… water play is so EASY, but it provides so much. I am so looking forward to a summer spent playing in the water, just like when I was a kid. 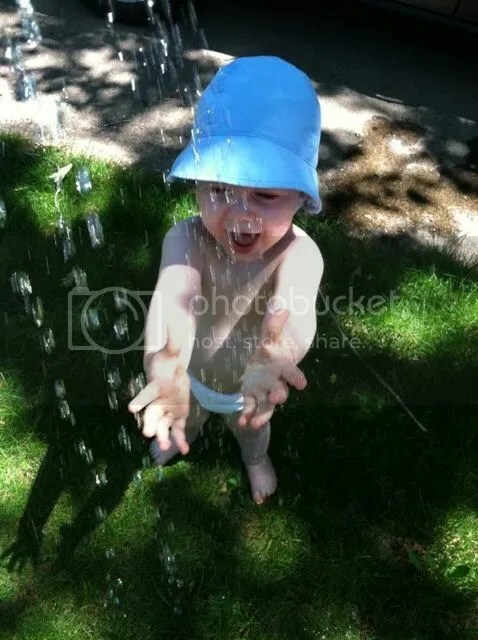 It won’t hurt that I am going to be very pregnant, and splashing in a pool and running through the sprinkler will be a lovely break from the heat. But I am relearning the greatness that can be found in something so, so common.